Fig and… Olive, Chaulmoogra, natural Vitamin E, Macadamia, Jojoba, natural beta-Carotene and Coconut Oil. 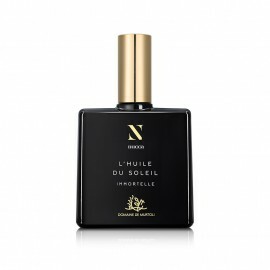 This queen of oils is not only seductive, but also gentle and smoothing. It is an all-round winner. Effective on all fronts, it delicately puts its eight high quality ingredients to work. Sometimes to accelerate, deepen, perfect and prolong a tan. Sometimes, on the contrary, to soothe, repair, nourish, regenerate and boost. The reward is toned skin and an enhanced tan. Not to mention the generous dominant notes of fig, which gives it its name and sensual fragrance.